These cute little cookies are perfect for holiday munching and giving. December 2010 Update: Click here to for the big, soft, and chewy version of these cookies, made with (or without) raisins. When I moved from urban Northern California to the wilds of Missouri (where I'd never been in my life) back in 1994, I dragged a number of things along with me that I will most likely never use again, but haven't yet been able to part with: my last few pairs of high-heeled shoes (absurdly out of fashion, I'm sure), a barely started sweater-knitting project and $80 worth of unused wool yarn, and over two dozen—now half-rusted—metal cookie cutters. When I was a kid, several times each year my mother would dig out various cookie cutters and we would proceed to make what I still believe are the best rolled sugar cookies in the world. Each baked and cooled cookie was then carefully spread with buttercream frosting made using the recipe on the back of the C&H powdered sugar box, because I do not come from the type of people who would ever dream of making something as pointless and unpalatable as royal icing when you could use buttercream instead. Last year I was talking to my mother on the phone while she and my stepfather were finishing up a batch of these very cookies. "Joel! You're putting on too much frosting and making the cookies look funny!" Then after a moment she gave an exasperated sigh, because the solution was painfully obvious. "Just eat the extra frosting!" The shape of the cutters and the color of the frosting we used depended on the season: we made pink hearts for Valentine's Day, yellow chicks and blue bunnies for Easter, and red & green stars, stockings, bells, reindeer, and Santa holding his sack full of presents for Christmas. Sometimes we would go all out and decorate the frosted cookies with colored candy sprinkles or those tiny silver balls that you can still buy in places like England and Australia but which are now illegal in the United States. When I grew up and became Head Cookie Baker in the household, I purchased my own collection of cutters, purloined the secret recipe from my mother, and proceeded to continue the frosted cookie holiday tradition. While I now happily spend countless hours baking my own bread and growing dozens of types of heirloom vegetables, I never seem to find the time to do all of that rolling and cutting and frosting. Cookies should be round and sliced from a log or made with a scoop is my new motto. Needless to say, you will never find a single gingerbread man or woman or child or cat or snowflake lurking among the hundreds of holiday goodies I cheerfully churn out each December. You will however, find lots and lots of these cute little round cookies hanging around my kitchen. Several years ago I did painstakingly make dozens of cheddar-dill crackers in the shape of penguins because I thought the recipient's kids would be amused by them. Little did I know the childrens' starving mother would inhale every single penguin while driving to pick up her little darlings from soccer practice without noticing a single one. I was introduced to the world of dark and spicy desserts very late in life. Growing up, I cannot recall ever seeing a jar of molasses in the house—perhaps because it didn't go well with buttercream. About ten years ago a friend offered me a square hunk of homemade cake that was a deep, dark brown but did not appear to be chocolate. My friend explained that it was gingerbread. Never one to pass up dessert, I took a tentative bite and could not believe what I'd been missing. I begged her for the recipe and went home and baked my own gingerbread cake, substituting homemade applesauce for some of the butter and adding more spices. I soon learned that recipes for this stuff abound, and that some people even frost it with chocolate buttercream. Where had I been? Then one day my hunky farmguy Joe asked me if I would bake him some spice cake but make cupcakes instead, because then more of the cake touches the pan and that, in his opinion, is the best part. "You mean like gingerbread?" I asked. Sure enough, on the same page as a recipe for Gingerbread, my trusted Betty Crocker cookbook offered a recipe for Old-Fashioned Spice Cake that did not call for molasses and met with Joe's approval. I added applesauce and raisins to the batter, frosted the cupcakes using the recommended recipe for Caramel Frosting, and watched as my approval rating went through the roof. According to the detailed notes I thankfully wrote in the margin, this happened in April of 2001. A few years later I decided to try my hand at making spice cookies. I made them big and soft with raisins and the girl at the local natural foods store told me they were the best cookies she had eaten in her life. I made them small and crunchy and am now expected to bake up a large batch every time my mother comes to the farm, with survival packages of cookies shipped to her between visits. The only difficult thing about this recipe is figuring out exactly what to call it. The cookies have all the makings of gingerbread, including molasses, but the original recipe mine is adapted from referred to them as spice cookies. A hopeful look through a random sample of older cookbooks on my shelf resulted in mass confusion. I found recipes for Ginger-Sugar Cookies and Spiced Molasses Cookies and Ginger Snaps. In the Joy Of Cooking there was a recipe for Old-Fashioned Molasses Cookies made with buttermilk that "are highly spiced." The Gingersnaps were described as "like 'boughten' ones in texture but with a dreamy flavor." And then there were the Ginger Thins, which I immediately decided should be called Gnash Your Teeth Ginger Thins because you are expected to make "about 300 3/4-inch wafers" by putting "dots of 1/8 teaspoon of dough 1-inch apart on a greased cookie sheet." Right. The most comprehensive list of recipes was in The Settlement Cookbook, first published in 1901 and sporting the trademarked phrase, "The Way To A Man's Heart" on the cover of my 32nd edition from 1965. In the index under "Cookies, Spice" I found no fewer than twelve different listings. There were Ginger Creams, Ginger Snaps, Ginger Wafers, Hermits (with raisins), Molasses Hermits, Card Gingerbread (which you make by thinly spreading the batter in a 9"x13" pan, sprinkling it with sugar, then cutting into squares after baking), Spice Cookies, and Raisin Spice Cookies (which were completely different than the plain old Spice Cookies), and Christmas Spice Cookies. There were recipes for Anise Spice Cookies and Springerle, which are also made with anise. But the best find of my search came from a 1964 copy of The American Heritage Cookbook And Illustrated History Of American Eating & Drinking (Number 2 in, I assume, a series) that I picked up for $2.00 at a used bookstore a few years ago but never read. This is a cookbook with a sense of humor. Next to the recipe for Gingersnaps it says that "these Gingersnaps, Miss Harland instructed in Common Sense in the Household, 'will keep for weeks, if locked up.'" Having found no right or wrong answer to my spice/snap/ginger/molasses cookie question, I decided to play it safe and include everything in the name of mine. Call these Molasses Ginger Spice Snaps whatever you like, just don't be surprised when they disappear quickly if they aren't locked up. Click here to see the whole photo shoot. These cookies are delicious both large and small, and the little ones taste very, good with a glass of bubbly champagne. You can make them soft, or you can bake them a few more minutes so that they're nice and crunchy. Everybody seems to have a favorite way of eating them, and even if you accidentally overcook a tray and believe that they are burnt, most likely there is somebody hanging around who will think they're perfect. If not, you can mail them to my mother. I highly recommend investing in a couple of heavy duty rimmed commercial baking sheets; at about $15 each, they're one of the best kitchen deals around. I've been using some of mine for over 20 years for everything from baking scones to roasting Brussels sprouts, not to mention baking thousands of cookies. Most molasses spice cookie recipes call for forming each cookie into a little ball. I never have the patience for that. It's easy to make perfectly round cookies if you portion out the dough with a stainless steel scoop. I own five or six different sizes and have had some of them for over 20 years, too. For these cookies I use a 2-teaspoon scoop. The key to making really good spice cookies is to use the best and freshest spices you can find. If you can't remember when you bought that dusty jar of ground ginger or cloves, it's time to toss it out. Freshly ground nutmeg is wonderful, and whole nutmeg will last for years. Plus you get to use a cute little grater to make it. As with most cookies, these freeze beautifully. They also stay fresh at room temperature for several days, making them perfect for holiday gift giving. I pack them by the dozen in little cello bags and tie with a colorful ribbon. I like the cello bags from Continental Packaging Corporation. These are real cello bags (many are not), prices are reasonable, there is no minimum order, and they ship quickly. As always, I urge you to seek out organic and local ingredients; they really do make a difference. If you prefer, you can substitute 2 sticks (1 cup) of the butter with natural, non-hydrogenated vegetable oil sticks, such as Earth Balance. In a large bowl, cream the butter and sugar with an electric mixer (I use a hand held mixer) on high speed for about 3 minutes. Beat in the eggs and molasses until well blended. Reduce the speed and mix in the flour, baking soda, salt, cinnamon, ginger, cloves, and nutmeg until well combined. (You can mix the dry ingredients together first in a separate bowl, but I never do.) Stir in the raisins if you're using them. The dough will be very soft, so put it in the fridge or freezer for a little while to harden up (very cold dough will take a minute or two longer to bake). Use a a 2-teaspoon scoop to portion out the dough and place the cookies on a heavy duty baking sheet lined with unbleached parchment paper (this is wonderful stuff, and you can reuse the same piece for the entire batch of cookies). The cookies will spread; I can fit 24 small cookies or 6 large cookies on a half-size commercial sheet pan (approximately 13" x 18"). Bake 10 to 14 minutes for 2-inch cookies, depending on desired consistency. In my oven, baking half-frozen, 2-teaspoon dough scoops for 14 minutes gives me 2-inch crunchy cookies. Reduce baking time for softer cookies. For big and soft large cookies, bake until the centers are set, about 15 to 18 minutes. For crunchier large cookies, bake them a few minutes longer. © FarmgirlFare.com, the sweet and spicy foodie farm blog where Farmgirl Susan shares stories & photos of her crazy country life on 240 remote Missouri acres - and we sometimes eat cookies for breakfast. YUMMO! those look so delish. i love ginger snaps. i'm so going to make these thanks for the recipe. i love baking and cooking! Yum! A FarmGirl specialty ... perfect. I have a copy of The Settlement Cookbook too, mine's a few decades older but reading this, I realized I haven't opened it since I started writing about food. Thanks for the reminder! Will you lose all the snow to 50F today too? Shazam! Those are some wonderful looking cookies (love the expanded name to cover all preferences!) OK - never one to hesitate to gild the lily - a dear friend introduced us to a similar cookie - dipped in melted white chocolate prior to being locked away! I sigh in remembered delight - somehow - Christmas is the right time to make fabulous cookies and FG has done it again! BTW - the previous posting - that Nanny Bear will protect everything for you huh? Bless that patient heart - a plate of plunderable preciousness just a quick DASH away for a smart doggie. Did you reward said protector appropriately??? Thank you for publishing your recipes. I went to the store and purchased all the ingredients for the use it or loose it lentil and escarole soup which I will be making today on this blustery cold day. I will let you know how it turns out! When I was growing up my mom would never buy brown sugar so we always used a mixture of molasses and white sugar which I think made cookies taste so much better...even though white sugar and molasses are essentially brown sugar. I had forgotten about all those little silver balls. Mum would put them on cookies she would bake for our birthdays. Gingersnaps we called gingernuts, my very favorite biscuits/cookies to dunk in tea. There is also a recipe in the dim recess of my mind,(another of my mother's) using whipping cream pineapple, sherry and gingernuts. I will have to go search for it. My Great-Aunt always had a cookie jar full of gingersnaps in her kitchen and I too remember making frosted sugar cookies every Christmas time as a kid. Now, I have a new cookie cutter and food coloring ready to go for this season. Thanks for the memories, Farmgirl. Great article, and thanks for the tip about the cello bags. I spent a fruitless evening recently searching for inexpensive bags but for some reason CPC never showed up on google. I'm ordering some with gold stars for my Christmas sugared walnuts right this minute! Thank you. Does this mean I now have to bake my own??? I am glad that you have such good memories of our cookie baking. P.S. The very first thing I ever remember baking was gingerbread with my Grandma using Dromedary Gingerbread Mix - and frosting it with Pink Buttercream Icing. oh, those look so very lovely! i keep meaning to try to create a gluten-free ginger snap to post on my own blog. 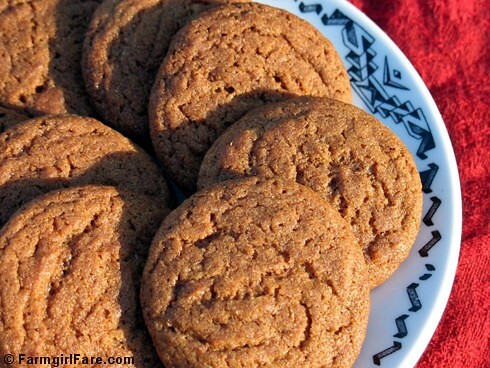 I love a gingery molasses-y cookie, especially this time of year, with a cup of milky tea. These look yummy. BTW, Whitey wonders if Studly Jeff might be just putting on his human counterpart a little bit? She says she always wears a sensible shoe, even when prancing around late at night. OMG. Do those look good or what? Will definately make them tomorrow! Those cookies look beautiful! I'm also sure that they taste wonderful. Oh wow, FG, those look goooooooood!! I recently got to try a really "sharp" tasting gingerbread (amazingly decorated) Scotty dog cookie baked by Wendy Kromer (www.wendykromer.com) - it had such an amazing ginger taste to it that I've been on the hunt for the perfect ginger snap cookie that has lots of kick. I might just have to bake up a batch of these to hold me over - they look gooood! BTW - You mentioned not being able to get the little silver balls here in the US anymore...that they were illegal? That's the first I'd heard of it, and still see dragees for sale in many of the local stores (in silver, and sometimes in pricier pastel or opalescent colors). Gonna have to do some research and see if there are types that are and aren't illegal??! Made the oatmeal bread awhile back - we loved it here at home, and it went over great with the coworkers! Even found out another coworker and his wife ALSO check out your blog all the time! For anyone interested in the matter of dragees, since Jeph asked -- as far as I know they're illegal in California only, and for the rest of the cookie-decorating nation they're supposed to carry a warning saying not to eat them. Not that that actually stops anyone. i loooove Ginger Spice Snaps! Why, another recipe with which to fill my friends and husband? OK! Yes, it is true, I am a shameless Farmgirl recipie whore. I won't lie. Oh, and that toasting bread is so on my When-I'm-Off-For-The-Holidays-I-Will-Bake-Everything list. I can almost smell them from here! But now that you've reminded me of the Settlement cookbook, I must go find one. I learned to cook from one as a kid but it got lost somewhere along the way. I just wanted to let you know i made these tonight they are AWESOME and i'm going to post a link in my blog to your recipe. i hope you don't mind! thanks for the recipe! Hard to get around here but I have some molasses in my cupboard now so I can make these cookies too. I am a cookie making addict from Holland. Did you now the word cookie comes from the Dutch word 'koekje'? This is also the title of a new book that has recipes of all authentic old Dutch cookies and new versions/twists on them (but only in Dutch for now). I think Dutch settlers took some of them with them across the pond. The Settlement Cookbook will be on my wishlist. Are you joking!? Are the little silver balls really illegal!? I almost forgot the vegetable oil because it does not appear in the recipe. 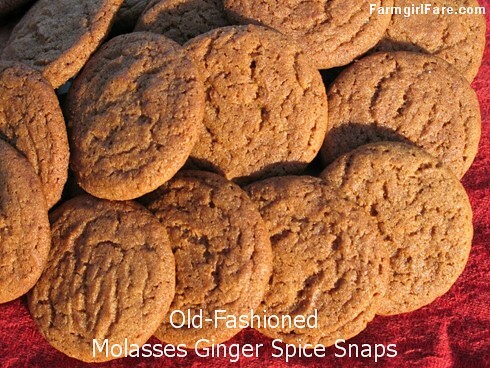 Thank you, these Farmgirl's Molasses Ginger Spice Snaps are too good. That would amaze me they stay several days in a box !! I think those will become one of my favorite cookies. I need to start baking again - the prices in the stores for cookies is just outrageous! And, they aren't nearly as good for you as homemade ones. BTW, how long do they last without freezing - like if you wanted to ship some as a gift??? Farmgirl how did you become so brilliant???? I love your recipes and your site. I just found it today. Next I will try to make your pitas. I'm just making these cookies for the third time since I discovered your recipe about 5 weeks ago. They are perhaps the best ginger snap/spice/molasses cookie I've ever had. Thanks! I made these cookies over the weekend and all my office-mates are enjoying the results. My office smells like cinnamon and cloves - wonderful! Thanks for sharing it. Farmgirl, I know this is an old post. But what type of cello bags do you buy? I went to the website and couldn't figure out which ones would be good for cookies? Thanks much! Any of the cello bags that Continental Packaging Corporation sells are suitable for packing cookies. Personally I like the heavy duty square style because that shape holds more, and the extra thickness provides a little more protection. There are all kinds of sizes to choose from. I bought several different ones and then matched them to the varieties of cookies I was packaging--long ones for biscotti, smaller ones for little cookies like these molasses ginger spice snaps, etc. You just want to be sure there's enough left at the top of the bag to seal it. You can actually heat seal them with an iron, but I simply tie them with curling ribbon which looks nice and festive. I have to post yet again about these cookies! I have been making them over and over, passing them out to different people, and everybody just loves them! I have to thank you again for the recipe. They are WONDERFUL! They've even managed to replace chocolate chip as my favorite cookie. Is there a difference between molasses and sweet molasses? I went to the store and they only had plain molasses..nothing about sweet? There are actually several different types of molasses, but what you want to avoid in a recipe (unless it's specifically called for) is blackstrap molasses, which is dark and has a slightly bitter flavor. It's usually specifically labeled as blackstrap molasses. What people refer to as plain, regular, or sweet molasses are what you want to use in these cookies. For more about the different types of molasses, check out this site I found just now doing a google search for "difference between sweet molasses and blackstrap molasses." Happy baking! Voted, The Best Gingerbread Cookie, EVER!, by my the folks in hubby's office. I used a muffin sized disher, and yes, these were huge! I baked them for 14 minutes, cooled them and then drizzled white chocolate atop. They were TO DIE FOR!!!! Do you have a version using butter? You can make these cookies using all butter or all natural margarine if desired - no need to change anything else in the recipe. Thank you for these delicious cookies! I stumbled upon your recipe when searching for a homemade gingersnap recipe. I need gingersnap crumbs for a Raspberry, Lemon, Gingersnap, Cheesecake Pudding Parfait I'm making later this week. I really appreciate all the advice you gave about cookie scoop size and baking time. I opted for a 2 tsp scoop and baking for 14 minutes after refrigerating the dough overnight. I also halved the recipe. This resulted in 50 perfect crunchy gingersnaps. Now I just have to keep my husband out of the freezer, where I plan to store them until later this week. Thanks again!! I don't even like gingersnaps and I had to freeze these before I ate them all!!!! I made them small and only cooked them for 5 minutes... they are so chewy and delicious! Thanks! I just shared my grandmother's recipe for soft, chewy gingerbread cookies. A little different from yours but a family and friend favorite for years. http://yes-you-can-can.com/2011/12/09/12-days-of-holiday-cookie-recipe-gingerbread/ BTW - not diabetic friendly but downright tasty! Can these cookies be rolled out and cut with cookie cutters? I'm not sure. I think the dough would probably be too soft and sticky, but you could always try it with a small amount and see what happens. I Made them and they came out PERFECT! Only thing i did different was i used Saigon Cinnamon, its a little spicier, yum! I just put the dough in to chill. If the cookies are anywhere near as delish as the dough, I am in love!! Thanks! Hi Susan! Merry Christmas! This is the recipe I always come back to and I'm about to make a big batch now! (was Maya @ Springtree Road lots of years ago) xoxo!